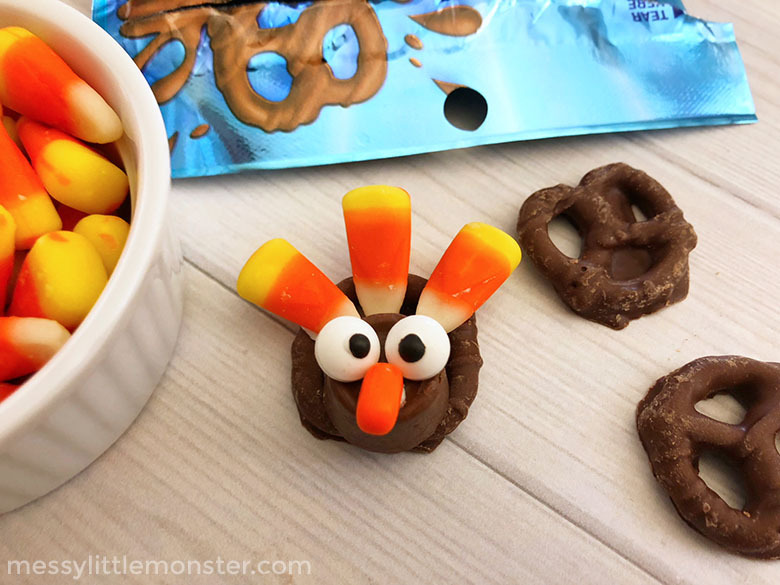 If you're looking for thanksgiving treats for kids, these pretzel turkeys are such fun snacks for kids! Chocolate covered pretzels are already such a delicious snack and the kids will love these fun turkey pretzels! 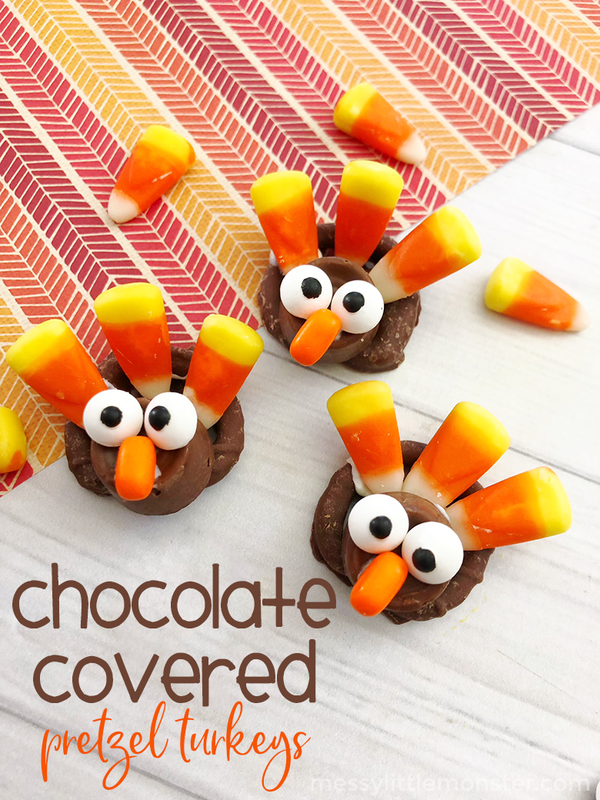 They can be made in a matter of minutes and would even make a great addition to a book related activity about Thanksgiving. Just follow the easy step by step directions to make your own pretzel turkeys! 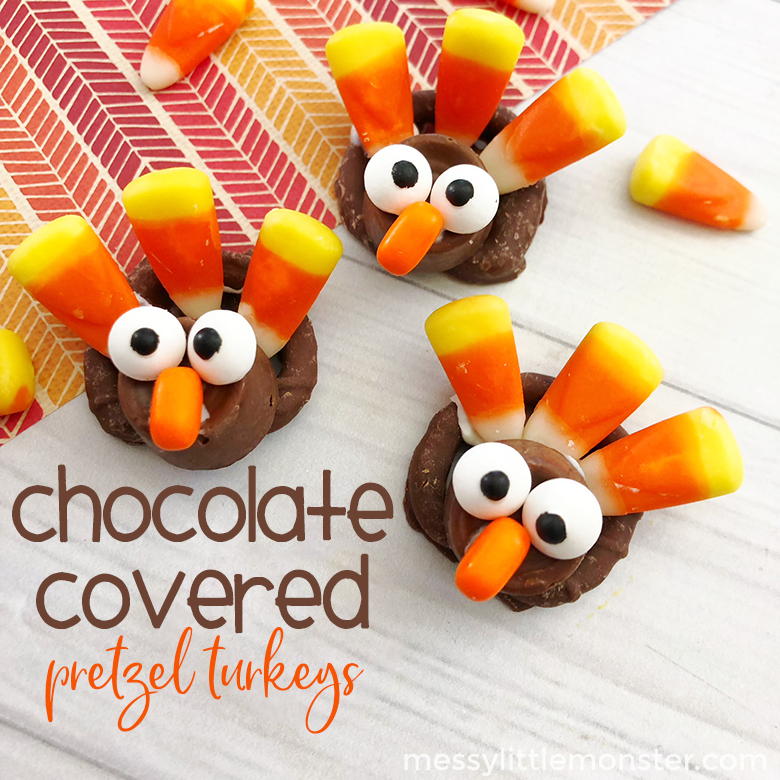 These pretzel turkeys will make such a fun activity for this time of year on playdates or even in the classroom. How much fun would it be to make enough for the whole class! 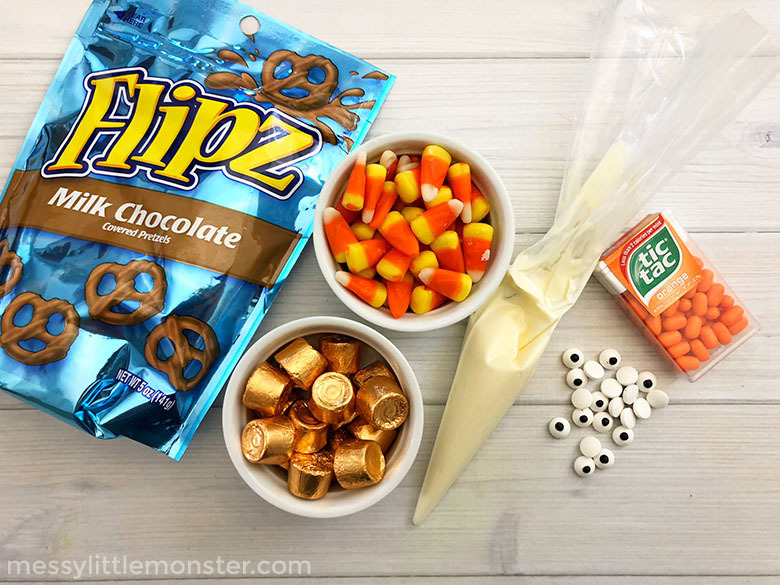 Whether you are looking for Thanksgiving treats for toddlers and preschoolers or for older kids these chocolate covered pretzels will be a huge hit with them all! Be sure to check out our other fun snacks for kids! For even more fun why not grab a Thanksgiving themed book like A Charlie Brown Thanksgiving or The Night Before Thanksgiving to go with your Thanksgiving treats for kids! take a look at our Thanksgiving turkey craft too! Note: you will also need parchment paper and a pastry bag for this fun snack idea! Before you get started, gather up all your ingredients. This makes it SOOOO much easier in the kitchen since you're not running around looking for everything. Prepare your pastry bag by filling it with frosting and then cutting a small tip off the end. Next, lay out your pretzels on some parchment paper and pipe some frosting on the top of them and then unwrap and place rolo candies on top of where you placed the frosting. The frosting will act as the glue. Once you've done that, it's time to make the turkey face! Pipe some more frosting onto the rolo candy and then place candy eyes and a tic tac to resemble eyes and a nose as shown below. Next, it's time to make the feathers of your turkey! Pipe some more frosting onto the back of the pretzel and stick pieces of candy corn to it. It helps a little if you try to stick them into the holes of the pretzel. Now repeat these steps for each pretzel turkeys you want to make! 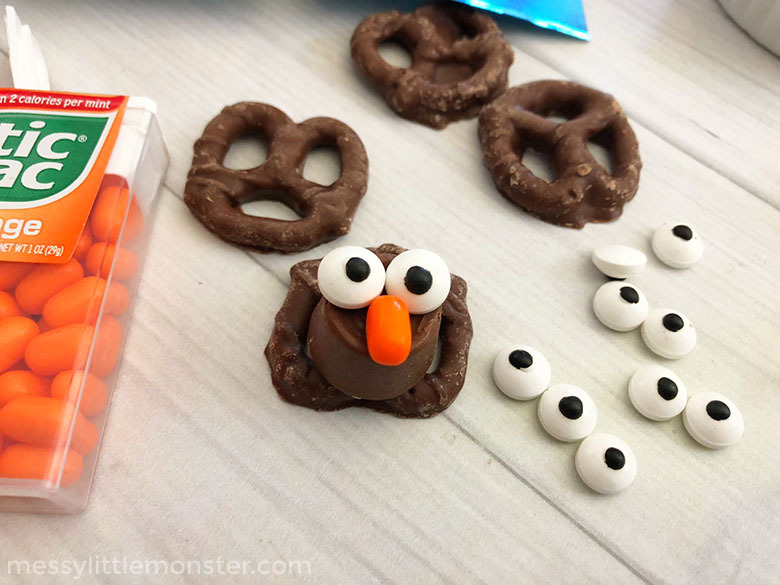 This is the perfect idea if you're looking for thanksgiving treats for kids and they will have so much fun making these pretzel turkeys! 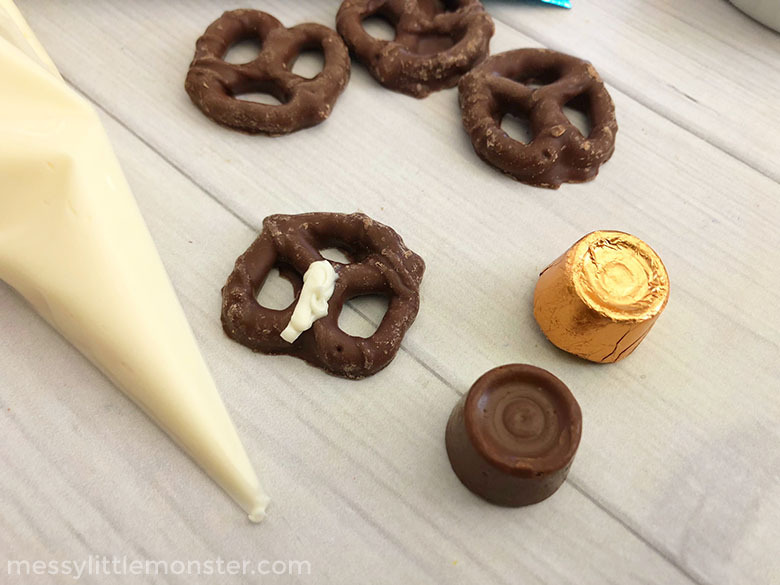 We love making fun snacks for kids around our house, especially when chocolate covered pretzels are involved! 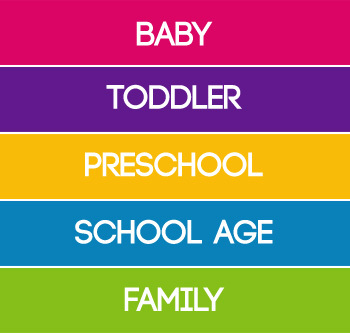 Be sure to check out more of our fun snacks for kids.